Integral frame in recyclable technopolymer, in air moulding. Reinforced with fibreglass. For indoor/outdoor use. Stackable. Cm 68x62xh.78, seat h.43 cm. The Ginevra collection now features the new lounge version. The spacious and larger seat embraces relaxation with flying arms and invites you to enjoy an afternoon or an evening of happy conversation. 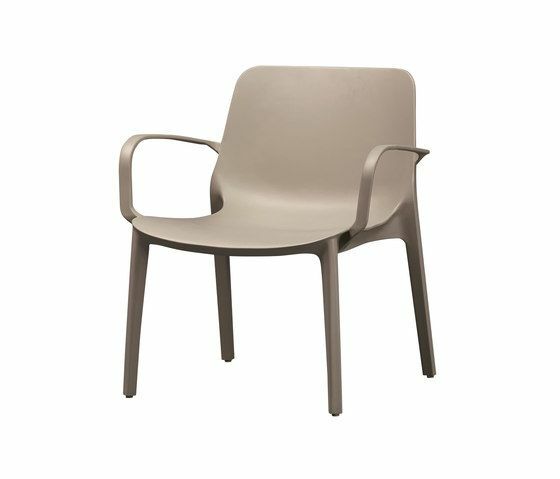 Particularly suitable for spaces with outdoor seating, coffee lounges, poolsides or in your back yard. The colours are all designed to impress: the linen, dove grey and anthracite grey model the corrugated shapes of the techno-polymer used to design this furnishing item.